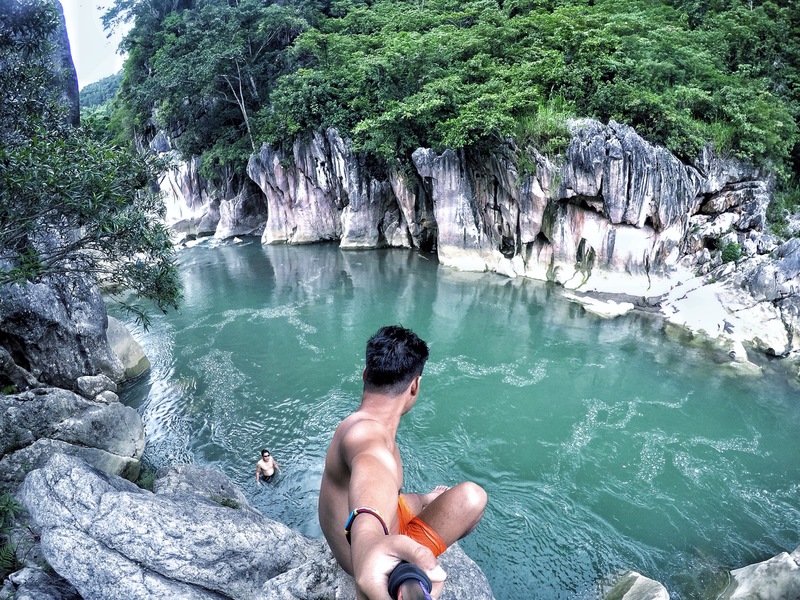 Dramatic marble rock formations, an in-cave natural swimming pool and its proximity to Metro Manila, make this gem a perfect getaway for the weekend. Tinipak is located in between boundaries of Barangay Daraitan in Rizal and General Nakar in Quezon Province. The river is popular to mountaineers since this is the main attraction after summiting Mt. Daraitan and it was also awarded as the cleanest inland body of water in Region IV. Stunning marble rock formations of Tinipak River. My recent trip to Tinipak River is not actually solo. I’m with a friend but I decided to write this guide for solo travelers since I cannot find one on the net. I was actually planning to go solo before but I was a little bit hesitant since I haven’t heard or read from anyone who did. The bridge going to the cave. From Star Mall in Shaw Boulevard, ride a commuter UV Express van going to Tanay Market. Upon reaching Tanay market, ride a tricycle going to Barangay Daraitan. It’s not hard to find them in Tanay since they will be the one to find you. Before riding, make sure to ask how much the driver will charge. Try to haggle but their rate is pretty much the same if you’re in a group of six. It’s also possible to ride a jeep bound to Sampaloc but you still need to get another tricycle going to Barangay Daraitan. After about 1.5 hours of tricycle ride, you will need to cross a river to reach Daraitan Barangay Hall. During summer, locals setup a bridge so vehicles can cross but during rainy season, they remove it due to the river’s water level. After crossing, ride another tricycle going to Barangay Hall. You will need to register and pay the environmental fee for Barangay Daraitan. After securing a guide, your trek to Tinipak River starts. The trek is easy but during rainy season, it’s muddy and the rocks were really slippery. Extra caution is needed. The trail to camp site. Before reaching Tinipak river camp site, you will need to pay another registration fee to pass a private lot. This is also because of ongoing disputes of which jurisdiction between Daraitan or General Nakar Quezon Tinipak belongs so both sides were charging separate fees. After another 10 minutes, you’ll reach the camp site which is also where the rock formations, swimming area and the cave are. If you wish to go inside the cave you need to pay to cross a makeshift bridge. Make sure to bring flash lights to appreciate the beauty of the cave. Headlamps are available for rent at Barangay Daraitan Hall. 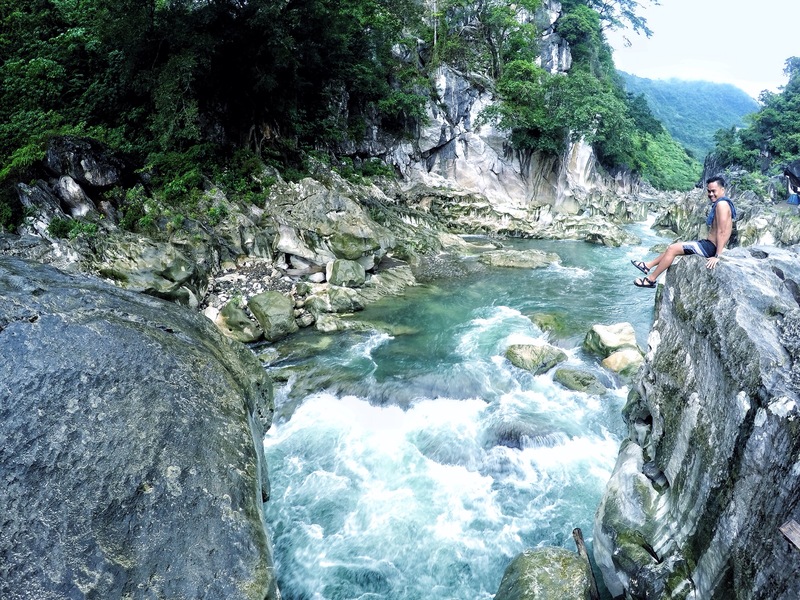 Cliff jumping – Ask you guide for the right spot to do it. The river bed is not consistently deep and some were rocky. Make sure to jump on the correct area to avoid any accident. Climbing up is a challenge because you need to swim against the current from one side of the river to the other. Explore Tinipak Cave – The cave is not as big and grand compared to the last I explored in Sagada but everything looks raw and alive. The highlight of this cave is swimming in a pool inside. Make sure to bring a camera with a powerful flash if you wish to take photos. My GoPro and flash light were useless inside the cave. Swimming – You can’t just swim on any part of the river. The reason why you have a guide is to watch over you and make sure you are safe. Some parts of the river have strong current so make sure to listen to your guide. Camping – Overnight camping is possible. Just bring you own tent and food. Be kind enough to bring extra food to share with your guide. 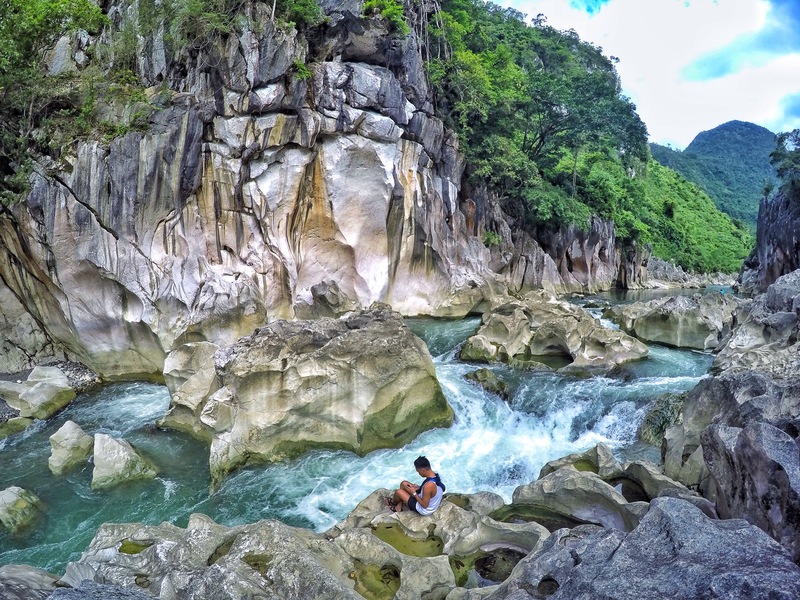 Take a lot of pictures – The rock formations of Tinipak River were just so dramatic and stunning on pictures and so Instagram worthy. For a destination near Manila, I want to make this trip as cheap as possible, but most of the time, travelling solo will require you to spend a little more compared to if you’re in a big group. Note: Above prices were based on current rates at the time of writing. Transportation from home to Star Mall and food expenses were not included. Bringing a private car is possible but please be advised that the road going to Barangay Daraitan is very rough and some were really steep. There is a parking space before you cross the river going to Barangay hall but it’s pretty limited. Hi is it worth going there? It’s very near from Manila and the trek is not that hard so I would say yes. Just make sure to check the weather before going there. I revisited the place just last Monday after it rained days prior and the river wasn’t at its calmer and bluer state. According to our guide, it takes 3 days before the water goes to normal level and color. If we’re going to swim, do we have to bring our own tent? hi, when going back to tanay market, do we have to make arrangements with a tricycle driver (roundtrip) or madami ng tricycles waiting there? If it’s okay with the driver to wait then yes. But I think it’s not necessary. I already visited Tinipak twice and we had no problems getting a trike back. hi jem.. we are planning to go there po kasi tomorrow. if may private van kami pwede din ba? hanggang saan pwede yung van nmen? we are planning for an overnight stay sa place. may mga few questions lang po ako. can we cook there? ro may nabibiling foods sa store na andun? like rice and ulam? lastly concern ko is it safe for an 11 yo and 15 yo kids? gusto sana nmen sila isama magasawa. thanks much hoping to receive ur response. Hi, there’s an area you can park before riding the boat to cross the river pero very limited yun. Possible na meron ng nakapark or if mataas masyado yung tubig ng ilog that area might be flooded just like the last time we went there. To be safe siguro sa Tanay proper nlang kayo magpark and get a trike to Daraitan. Yes you can cook there, just bring your own cookwares. The nearby store can also cook for you but it’s 10-15minutes away from the camp site and the food they have is very limited. The last time we went there, lucky me pancit canton lang ang meron sila. Regarding safety for kids, I think yes, if you will not summit Mt. 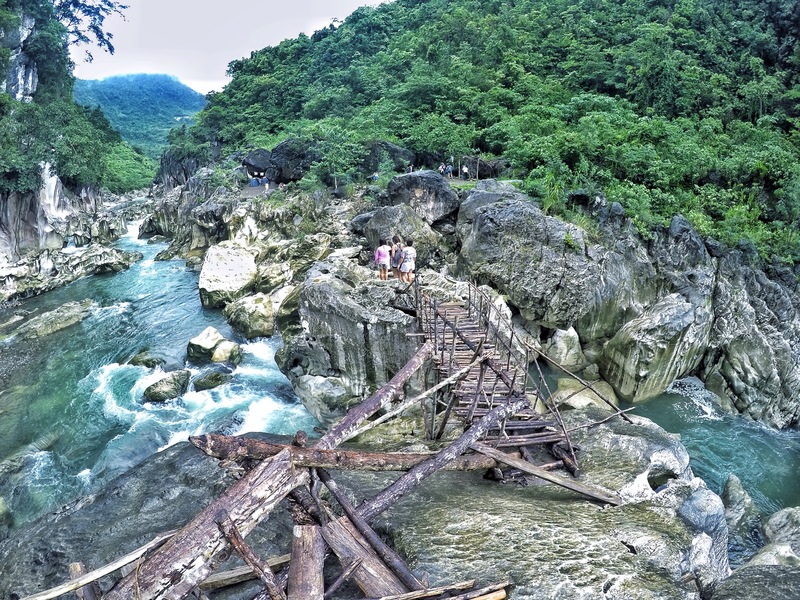 Daraitan, the trek to Tinipak Rock formations is very easy. The guides were very active in watching over their guests especially when swimming(depends on water condition). Good evening. Planning to visit Daraitan on March 24,2016 sino po puede naming contact person? Can you please give me a number? Thank you. Hi, I don’t have a contact person but I’m pretty sure there will be no problem even if you walk in. I asked our guide the last time if they experience shortage of guides on busy days like holy week. He said they are adding additional guides on the days they expect huge influx of visitors. Can we go on private car? What time do we need to be there exactly on baranggay Daraitan? What time it opens for us to register and start? Thanks! Can we go on private car(suv)? What time does the baranggay hall of daraitan opens? Do we have to wait for it to open before we start the trip? What are the things we need for a day trip? What is the best itinerary for a daytrip? Hi! Yes you can go there on private car. Since it’s summer, I think meron na bridge to cross the river(not 100% sure tho), if yes you should be able to bring it sa Barangay Hall. Regarding things to bring, basic lang na kailangan nyo like damit, towel, drinking water and if you plan to stay longer dala kayo ng pagkain. You may bring a flashlight/headlight as well for the caving if you don’t want to rent it from Barangay Hall. As far as I know, available anytime ang Barangay hall but I would suggest to go there early specially if you plan to climb Mt. Daraitan para hindi masyado mainit. If you only plan to go to Tinipak river, being early is a good thing too to avoid the crowd and if in case maisipan nyo magside trip to other attractions in Tanay. Hi Jemseal. May mare-recommend ka ba na guide? Thanks. You can’t really choose a guide. They have a queue that needs to be followed. Dual citizens n kmi exercise nminang walking dto sa peak sa GSIS di b mhrap ang paglkad ppiunta jan sa river? Not a walk in the park pero kayang kaya. Plan sana samin magpunta sa Tinipak sa 30, ask ko lang sa mga nagpunta ngayong April 2016 kung magkano itinaas ng mga pamasahe? Ty! Hi, I think it’s perfect for a prenup shoot. The hike/trek depends on your pace. It took us a little more than an hour to reach the actual rock formations. Hi. Guide fee is good for up to 10pax. hi, plan din namen magpunta ni gf sa june. nakita ko ung trike mo from tanay market to brgy daraitan is 400 and another 400 pabalik, kahit ilan ba kami sa trike per hear yung 400? and yung sa guide, since day tour kami and dlwa lang kami, 250 each tama ba?? thanks sa reply. Hi Lance. As far as I know 400 is good for up to 4 pax. For the guide fee, 500 (day tour) is good for up to 10pax. Hi I just want to ask kung safe ba mg solo travel ang babae doon? Hi Mika. Yes it’s very safe. All the guides were registered and and for sure they will take good care of you. Hi Jemseal, is it advisable to bring a 9 month old baby . Gusto ko sana isama. Hi Lucas. You can but I wouldn’t recommend. 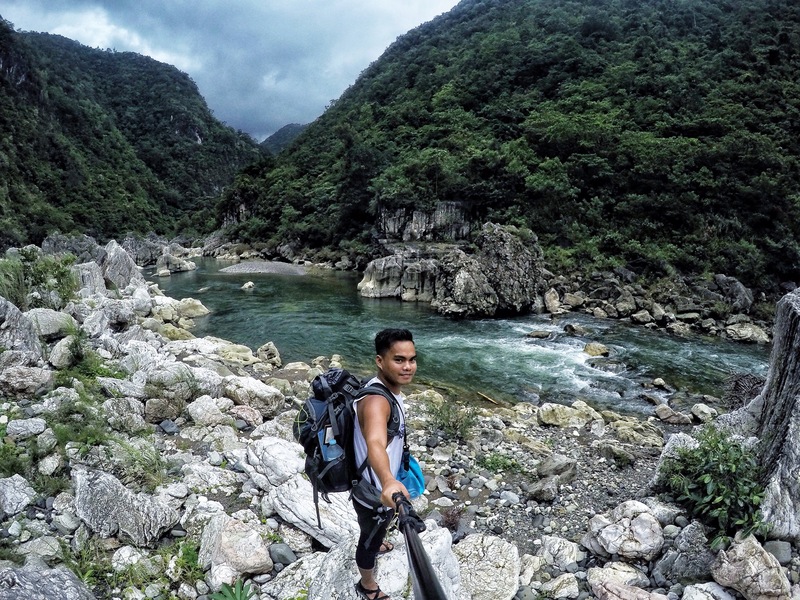 Yes, the hike is pretty easy but there are times na medyo madulas ang trail. Hi Jemseal , s it ok to bring my 9 month old baby to Tinipak River. . I think enough nman ang time, depende kasi if how long you plan to stay. I haven’t been to Masungi so I’m not sure how much time you need there. But if you plan to go to tinipak 1-5pm(without the travel time), I think that’s more than enough. Hi jem. May I ask if UV Express Van fare still the same? Same with the tricycle fare? Hi, I’m not sure if it’s still the same. The last time I went was December of last year. Hi jem, one more question. What’s the capacity of the tricycle? Can it accomodate 5 persons? Or would it be limited to only 4 since travel time is 1.5hrs? I think it can accommodate up to 5 depende na siguro sa arrangement nyo ng driver if papayag sila. magkano yung rent sa tree house para sa overnight? Hi! I wasn’t aware na may tree house dun. Pero I know na mat mga kubo for rent malapit sa rock formations. Unfortunately, I wasn’t able to ask the rent. is it safe for an 11 year old girl to the summit of tinipak? wud it be advisable to bring a child there specially for noobs like me and my daughter? Hi! if we have a private car, from the summary expenses that you mention , alin po dun ung maleless namin, and also were planning to do a prenup there , meron po bang fees or requirement na kailangan? Hi Mark! I’m not sure if how much yung savings nyo if you’ll bring a private. Di ko din kasi alam if how much gas it will consume to go there. Siguro from the summary of expenses I mentioned, just remove the fare from Manila and the tricycle rental from Manila to Daraitan. Regarding photoshoot nman, not sure if may requirements sila pero as far as I remember the fee is 500 for a group of 10 persons for a day visit. Hi jem.. is it ok khit wala ng mag guide? 2 lng kc kmi. Although hindi naman nakakalito yung daan, required pa din kayo kumuha ng guide. I would recommend to get one as well. It’s for your own safety din specially if pupunta kayo ng cave and magswimming. Medyo delikado yung tubig sa Tinipak for swimming so mas okay if you have someone to look after you and someone na familiar sa behavior ng river. Not sure if 24/7 ang Vans from Shaw pero if you’re planning to leave at 4am from Manila, I’m pretty sure na may available naman. Going back to Manila nasa Tanay Market ung same UV express vans na pabalik ng Manila. hello, me and my friends would like to stay overnight ask ko lang if yung total ng expenses mo is good for how many persons? I mean 2265 each person? we bring our own tent. is it okay to bring alcohol drinks? Hi! Yung total expenses ko is good if you are going solo. But if you’re coming with friends, the guide fee can be shared for up to 5 persons. With regards to bringing alcohol, I think it should be fine. Hi. Gaano po katagal ang from Brgy Hall to Tinipak River? It depends on your pace and the river’s water level. Like the second time I visited the water is so high because it’s been raining for the past days, that we need to climb up to huge rocks so that would take more time. But in general, if you come in a good sunny day, you should be there in 1 to an hour and a half. Hi Peng, it was only 500 the last time I’m there. I wasn’t aware if they had an increase. Not sure as well if they require permits now. Im a Vietnamese solo traveler, do you think this is safe for female and how can I find a tourguide ? Do I need to book in advance? How much is the entrance fee now? I went there last summer and if I remember correctly it’s already 100pesos. Hi,would you know if they are open on Sundays? Maganda umaga Ginoong Jem 🙂 Maitanong ko lang po, kayanin kaya ng motorsiklo mamin yung pagtawid dun sa water area para hindi na kami mag tricycle? Maraming salamat! If ngayong summer kayo pupunta yes kaya nman. Usually may tulay patawid kapag summer.